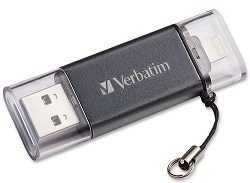 Exchange files quickly and easily between your Apple device and USB-equipped PC with Verbatim’s Store ‘n’ Go Dual USB 3.0 Flash Drive. Instantly add storage to your iPhone, iPad or other Apple device, so you have room to capture more photos and video or free up memory for new content. MFi certified, this drive is designed for use with Apple iPhone, iPad and iPod products, ensuring the highest quality and reliability. Using Verbatim’s free Store ‘n’ Go app, available for download from the App Store, you can transfer and view content on your drive. Transferring those files to your PC is a snap – simply insert the drive into a USB port and move content as you please. Apple certified MFi product – Made for Apple iPhone, iPad and iPod devices with Apple Lightning ports. Compatible with iPhone 6/6S, iPhone 6/6S Plus, iPhone 5/5S/5C, iPad mini/mini 2/mini 3/mini 4, iPad 2nd/3rd/4th generation, iPad Air/Air 2, iPad Pro, iPod Touch 5/6.